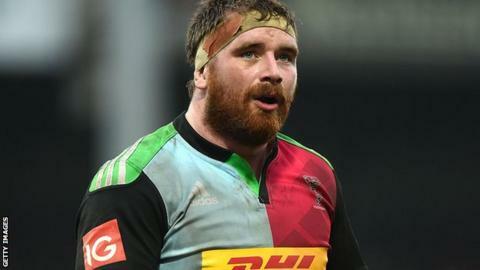 Harlequins have signed tight-head prop Matt Shields from National League One side Darlington Mowden Park. The 24-year-old has been training with Quins in recent weeks and has featured for the club in the LV= Cup. The former Nottingham and Plymouth forward, who previously spent time in Newcastle's youth academy, has agreed a deal until the summer of 2016. "We see Matt as a player with real potential who we can really develop," director of rugby Conor O'Shea said. Shields, who joined Darlington at the start of the campaign, said it was "a huge honour" to join Harlequins. "It's a fantastic club with a great tradition and culture," he said. "I am looking forward to seeing this season out and building for next year working alongside Conor and the other members of the coaching team to develop my game. "I'd also like to thank Darlington for giving me the chance to pursue this opportunity early and for being so supportive during the process."